Just as it did last season, it took all 82 regular season games to determine the participants. Sorry Dallas and Carolina fans. Gone is the fun and gun offense of the Caps. They are a defensive first club this year, which will have prepared them well for the grind of the playoffs. 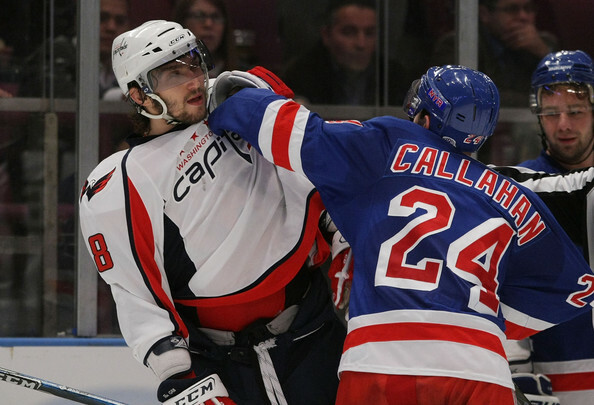 Unfortunately for the Rangers, gone is the heart and soul of the team, Ryan Callahan. Gone also are all the goal from Marian Gaborik's stick. What happened? Nevertheless an upset here can very well happen. The Rangers gave the Caps fits at times during the regular season. New York is a physical and nasty team. Washington just doesn't have that playoff magic. This series will twist and turn enough to make both fanbases sick. The Flyers faded down the stretch, while Buffalo played some of their best games when it mattered most. The teams split the season series, and the Sabres clinched their playoff birth in dramatic fashion in OT against these same Flyers. 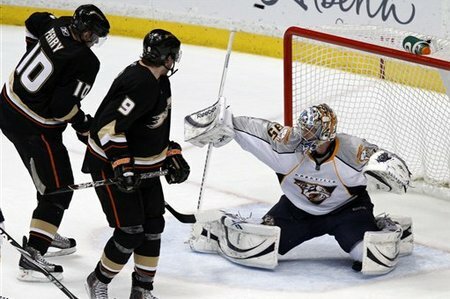 Ryan Miller certainly has it within his power to steal this one, especially if Philly's Chris Pronger cannot play or is not up to the challenge coming back from injury. However, we just cannot see the Flyers going out so easily. Buffalo just will not be able to keep up with the firepower of Philadelphia. This one is special. Counted in the score somewhere will be the gallons of blood spilled in this series. Something like, "Bruins 2 goals, 4 pints of blood to the Canadiens 2 goals, 3 pints of blood." Who won the game? Easy. The Bruins with the extra pint! Forget the Original Six stuff, the storied rivalry, etc... this is about pure ill will between these two rosters. Both teams will downplay the hype verbally, but there will be some loud talking out on the ice. The Bruins are flat out better everywhere. They will find a way nearly each night. Sadly this won't be a tandem battle of Sid and Geno vs. Stamkos and St. Louis, in this first ever post-season matchup between these two clubs. It is possible that Sidney Crosby will be cleared to play again while this series is still in doubt, but don't count on it. Pittsburgh has had to make due with the blue collar types for the entire second half. That fact only enhances their chances in round one, facing a rather inexperienced Lightning squad. Look for dirty goals to pinball past Tampa defenders, as Pittsburgh grinds this one out. 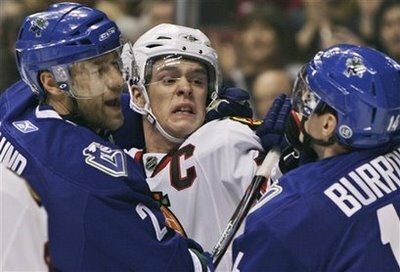 Vancouver hopes that the third time really will be a charm. 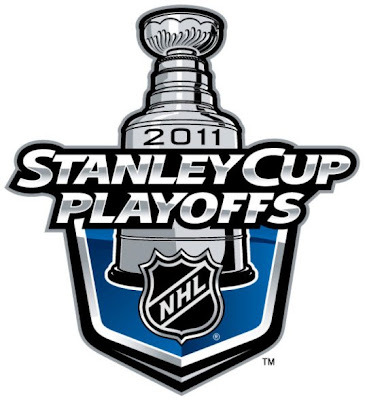 Knocked out the previous two years by Chicago, the Canucks dominated all season, winning the President's Trophy. The Hawks struggled all season to stay in it, and actually needed a little help from Dallas to get in. Should be a slam dunk, no? Maybe not so fast... well, ok, it's a slam dunk. Vancouver would have to have an epic collapse to blow this. The battle of California. In the West, this is the series that reeks of upset. The Sharks were very solid down the stretch. The Kings were too, but no one really noticed. They lost two of their top scorers, but battled to the finish. Regardless of their long run last season, we are talking about the Sharks... and the playoffs. Big expectations, little follow through. Although we don't want to, we will buy the Sharks in round one. 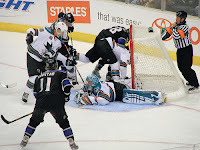 The Kings start this round shorthanded and just won't be able to find the extra gear. Same matchup as last year, different seeds. The Wings were favored last year, despite being the lower seed. The 'Yotes gave them all they could handle, but Detroit prevailed. This time, Detroit rides in high, in spite of some recent injury issues. Phoenix just doesn't have the mystery power from last season's surprise run. Detroit will do what they do. Corey Perry willed the Ducks to the post-season with some goal scoring brilliance. Nashville took the Pekka Renne train all the way to another uneventful, even-paced ride. It doesn't matter how many time Barry Trotz steers his Predators into the playoffs, Nashville just gets no respect from fans or the media. This space is no different.